Making smart renovations and improvements to your home. What Is The Right Amount of Money to Spend When Upgrading Your Home? You’re wanting to freshen up your house a little bit and you’ve already determined what you think you should do to make it amazing for you to really enjoy it. Before you jump into your renovation project, make sure you set a budget so you can spend the right amount of money upgrading your home. Without a plan and a budget, you can spend tons of money on all kinds of neat options — from a new marble island-top for your kitchen to a swanky hot tub for your backyard patio — Be Careful! There is a good chance that you might not get back even a fraction of what you pay for these additions to the home when you decide to sell a few years down the road. Now, you might be staying for a long period of time and this may not be a huge concern for you. But plans change all the time and you want to make sure that you can get at least a portion fo what you spent back in the event you need to leave sooner. Overall, it pays to limit your spending to what you might reasonably hope to get back when, and if, you do sell. Most homeowners are not talented contractors: plumbers, flooring experts, electricians, finish work experts, etc. As such, it’s obvious when you see their home that the homeowner did the work and not a professional. This actually has a negative effect because it kills both the actual and perceived value of a home. Any work they did that was shoddy will be perceived by any new would be homeowners (buyers) as having to be redone after they move in. It might only cost a few hundred dollars for several gallons of paint, some rollers and a brush or two, but it will cost $1,500 to $3,000 to fix the job and have the room(s) totally repainted. Do yourself a favor and pay the extra money to have a professional do the work you want done. The long-term value of quality workmanship will serve you well over the long term. Nobody spends more time in homes in the area than real estate agents. Check with your favorite agent to find out if your project is adding value, neutral, or perhaps even taking value away from your home. If you don’t have a favorite agent, click here to find one who can give you their expert opinion on which upgrades matter. Again, it’s likely that your agent has been in hundreds if not thousands of local homes over the years. They have worked with scores of buyers and sellers and know what works and what doesn’t in a home. They can be a great asset when deciding what buyers and sellers like. Before you spend a dime, be sure that you’re aware of what your deed restrictions or HOA rules dictate. It doesn’t matter if your neighborhood has an HOA or not. Most neighborhoods have some sort of deed restrictions and some improvements may be prohibited. You likely to have gotten a copy of your deed restrictions when you bought your home. If you can’t find them, the attorney’s office who handled your closing likely can provide you a copy or you may have to contact the local Register of Deeds office in your area. Knowing all of this, then what’s the right amount of money to spend on upgrading your home? A good rule of thumb is to spend no more on each room than the value of that room as a percentage of your overall house value. If you don’t know the value of your home, contact a local real estate agent so they can give you a good idea of what your home will sell for in today’s market. If you’d like, you can click here to get the current value of your home. Remember, it’s easy to let your budget get out of control when making improvements to your home. 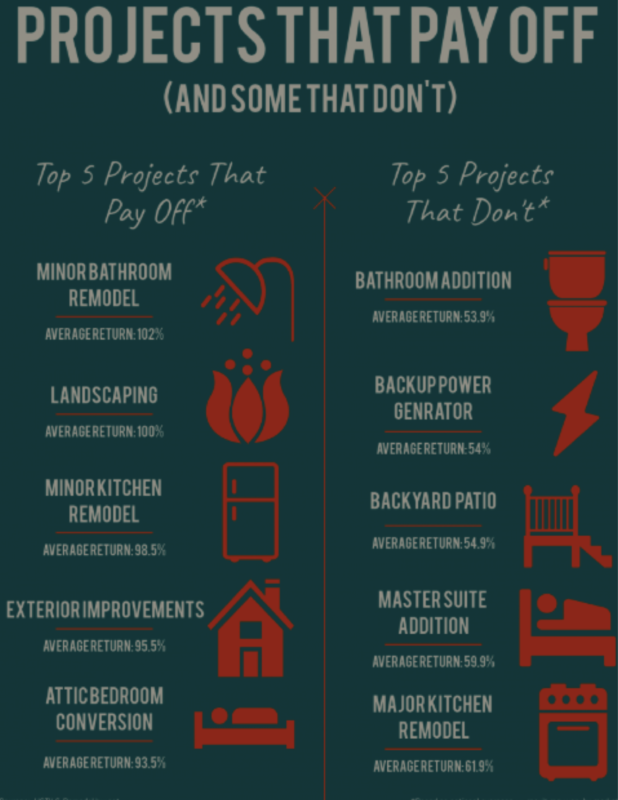 Using these guidelines will help you plan and budget to make smart renovations and improvements.